Happy #WellnessWednesday guys! You have heard it before .. but eating well really can be as simple as just making some "modifications". You can have pretty much any food your heart desires...you just have to stop and think about how to make it healthy!! I eat lots and lots of potatoes everyday and I don't enjoy "baked" potatoes so much that I would want to eat them multiple times each day. But I do love me some french fries, hash browns and fried potatoes with onion. So ... I fry them :) Okay not really fry them in the way you may be thinking, but they do taste pretty darn similar to those "fried taters" my Granny used to make for me. Ohh what I'd give to have those by the way!! My dream cheat would actually be to have her famous biscuits and gravy! Yes they were famous. Think of the best ones you have ever had and magnify that by about 1000. Obviously that would be my "dream cheat" for reasons more than the food itself. Since I have celiac now I wouldn't be able to have them (however she totally would have modified her recipe for me) and because she is no longer with us (damn you cancer). Okay .. back on subject. For healthy "fried taters" it is as simple as cutting up your own potato and using some olive oil spray :) If you are against the sprays .. then use real olive oil in a mister bottle. Just know that it should be counted as a dose of your daily healthy fat and it does take a little bit to make them crispy and yummy. I've used coconut oil in the past to "fry" them too! I like that better than using real olive oil. Many of you won't want to take the time to cut em up. Well ... I don't either! I told you a few of my "As Seen On TV" products the other day .. I FORGOT MY BEST ONE!!!! It's from HSN .. but they have similar ones on amazon, at walgreens, etc. It's just a little gadget .. you put in your potato in it (usually at an angle) and push down and it makes FRIES!!!!! Our attachment comes with skinny or thick!! I don't know the quality of the ones on amazon or the as seen on section of a store .. but the one we got at HSN is great! ** Cut up potatoes of choice - wedges, strips, however you want. I usually do 3-4 potatoes at a time so I only have to do this a few time a week. However ..the more you try to stuff in a pan .. the longer it takes .. and I think the less crispy they get. ** Spray evenly with Olive Oil Spray or coat with real olive oil if you are choosing that route ((When I use coconut oil I just melt in the pan and stir to coat well). You can also put them in a bag and put the olive oil in and shake with seasonings. I don't use any seasonings while cooking them because I change what seasonings I use each daily and as mentioned make a big bunch at one time. ** Put in pan - medium high heat (a little more toward high) -- cover with a lid and stir often! You will have to watch them so they don't burn. I just let them cook covered until they are the texture I like. I sometimes add more spray. I also cook for a little while uncovered toward the end. Bake for 25-45 min. Depends on how you want them cooked and your oven. I often put them on broil the last couple min to make them good and crispy! As for seasonings - same as above. I season after depending what meal I'm eating them with. 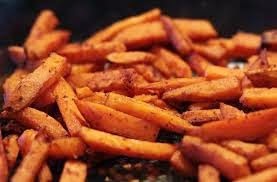 But if it's sweet potatoes I almost always just use a little cinnamon! Anything spicy is good on them too! Eating healthy doesn't have to be BORING!! You can have french fries or fried potatoes. Just gotta think outside the box! Because I do this so often - it's rare that I ever crave "real" french fries!